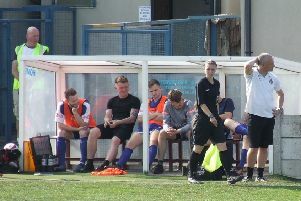 Clitheroe claimed a point at Kendal Town on Bank Holiday Monday, after a sobering 4-0 defeat at the hands of promotion favourites Scarborough Athletic on Saturday. At Kendal, the Blues produced a mixed performance, but the Gods and the woodwork were against them. The first 25 minutes were dominated by Kendal, as the tweaked Clitheroe line up looked to bed in. The Mint Cakes took the lead just past the midway point of the first half when an out swinging corner found the unmarked Martin Grundy, who nodded the ball into the far corner. But on 34 minutes, Clitheroe pulled level as Charlie Russell pinged a sublime cross field ball to Kurt Willoughby on the left, who drifted inside and drove the ball home right footed. The second half was all Clitheroe. On 48 minutes, a bouncing clearance went beyond the Kendal defence and Willoughby hit the ball on the volley onto the bar. Just before the hour, the ball was flicked on by Sefton Gonzales to Joe Mitchell, whose sharp volley was well saved. Clitheroe entered a real purple patch and Mitchell drove the ball narrowly over, before Gonzales flicked the ball on to substitute Adam Bolton, whose snap volley was deflected over the bar. With injury time looming, Jacob Davis thundered a header goalward from a corner and was denied by the woodwork. On Saturday, Clitheroe could have few complaints after a classy Scarborough swept them aside in the first half. On 11 minutes, a free kick was swung in from the right, Chris Thompson parried a header, but the loose ball was driven home ny Nathan Valentine. On 22 minutes, a deep cross was lofted over the defenders, for the Michael Coulson, who steadied himself and fired inside the near post. Three minutes later, Max Wright held off a series of challenges and slammed home. The visitors kept up the pressure in the second half, and added a fourth after 67 minutes when Valentine met a Wright cross with a diving header.